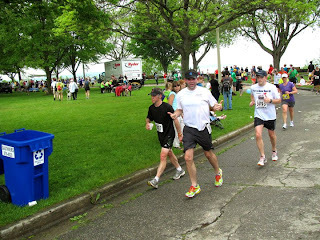 Last Sunday, the 29th of May, I finished my second open marathon - the Vermont City Marathon in Burlington, VT. It was hot, humid and, by the time we reached mile 20, the signs posted at the aid stations read, Caution - High Risk. While the race officials were Ready for the Heat, that didn't keep it from affecting how I felt while running. Not to mention the pothole I found at mile 7 (see the image of my foot below from Monday afternoon). That bruising and swelling did go away pretty quickly and, according to my awesome podiatrist, Dr. Marc Lederman from West Hartford Podiatry, there are no broken bones. I think I lucked out there. Excuses, excuses, I know. My gun time was 4:17:30. That is 7:07 slower than my first and I was in WAY better shape for this race. What changed? Everything! I wasn't doing this race for me...well, I was, but in a different way. 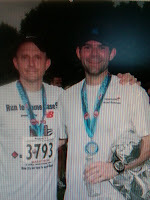 I was running this one with Ted (even though he is a little behind me in the first pic - we really did run it together!). This was his first full marathon. He got to experience all of the challenges first hand. We were using this race just for the experience, so he can know what to expect when we take on the ING NYC Marathon this coming November. I think we will be in a great position to really enjoy it! So, about the race...it isn't my favorite course - by far. I think we crossed under the start line three different times, as the course is designed (as it was explained to me by a 3:45-finish pace leader) somewhat like a clover. It felt more like an X to me. Out and back one way, out and back another, etc. Also, while the 3:45-finish pace leaders were friendly and inclusive, I felt that they went out WAY too fast. There is a pretty significant hill at mile 15 that we were planning for by "putting time in the bank" early on, but by the time we got there, the group had thinned out significantly. I haven't uploaded my splits from my Timex Global Trainer, but if my memory serves, we had at least three sub 8:15 min/mi with one definitely sub 8:00 min/mi. When you are shooting for an 8:35 min/mi overall pace, that is pretty quick early on - in my opinion. I am more of stick to pace in the beginning and then negative split the last few miles. I thrive on that model and, after this race, think I will no longer utilize pace leaders. To wrap it up, I am glad that I did it. 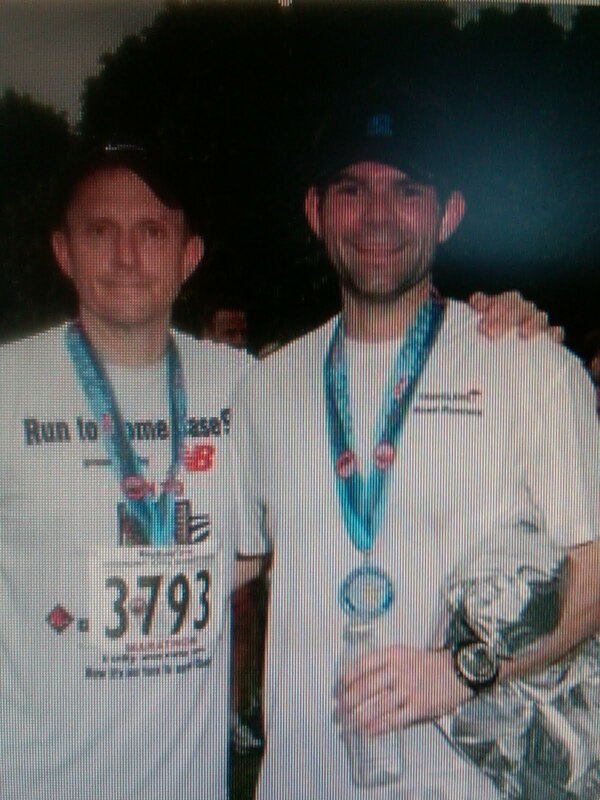 It was a good trip and I had another great race with Ted. Having a running and training partner is awesome. Enjoy! It is good to be back with you all.